We love these comfy, stylish shirts and hope you will too! 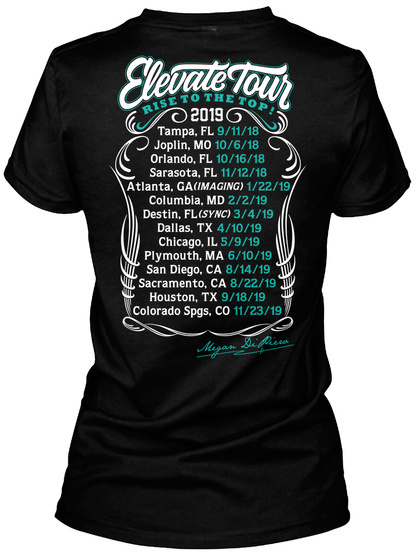 Be sure to show off your Rise-to-the-Top spirit at the upcoming tour stops. (Tour dates and details featured on the back.) Megan promises to buy you a drink if she spies you in the tour tee! This shirt is a figure-skimming, baby tee style. Be warned it runs rather small and shrinks a bit when machine washed so we suggest you go up a size OR TWO! Megan wears a women's size 6-8 (medium) and found this shirt to be comfy in size XL and form fitting in size Large. This version is a tri-blend which is only 25% cotton so it maintains its size pretty well when machine washed. These shirts run small. Aric is a size men's Large and liked this shirt best in XL. **Though not figure-skimming like the boyfriend tee, women who want a looser fit or want a bigger size range will enjoy this style too. Megan wears a women's size 6-8 (medium) and found this shirt to be comfy in a size Medium and snugger in a size Small.